LOS ANGELES--(BUSINESS WIRE)--Social Bluebook™, founded by alumni from Maker Studios, announced today the availability of a robust search function in its platform, allowing companies to intelligently evaluate what to pay an influencer for branded content and custom influencer marketing. Social Bluebook is the only intelligence tool available that measures the most key factors when picking an influencer partner: Demographics and engagement. Marketers can sign up for Social Bluebook for free by clicking here. With ad blocking stats reaching a staggering estimated cost of $41.4B in 2016 alone, brands realize that engagement through social media influencers is one of the most attractive methods to reach their audiences. Until now, the tools available to measure influencer values often lacked comprehensive data to support marketing decisions. 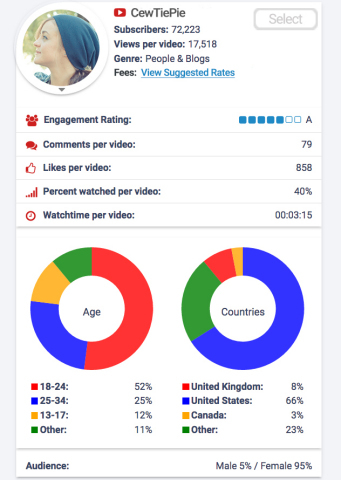 Social Bluebook’s new search functionality allows brands to research and evaluate creators and social influencers through the firm’s proprietary online platform, empowering them with timely data regarding audience demographics, level of engagement, average views, audience comments and more. "Social Bluebook Search has literally cut our labor costs by 80% and dramatically improved our selection process of influencers,” said Travis Chambers, founder of Chamber Media. “Previously we had a whole team dedicated to manually curating internal outreach lists and performance metrics. Now only one to two people are needed. It's refreshing to finally have access to a tool that removes the biggest headaches that come with influencer outreach." Social Bluebook aims to help social media influencers make the money they deserve so they can do what they love. For more information, visit http://www.socialbluebook.com.